This story was retrieved from the U.S. Navy website. Neither the U.S. Navy nor any other entity represented in the article endorses this website. 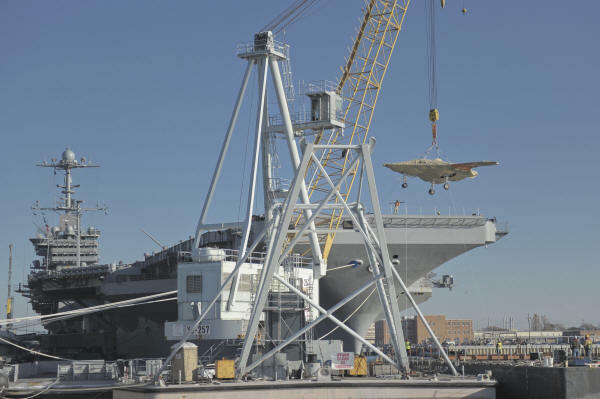 NORFOLK, Va. (NNS) -- The Navy hoisted an X-47B Unmanned Combat Air System (UCAS) demonstrator on board aircraft carrier USS Harry S. Truman (CVN 75) Nov. 26, in preparation for an unmanned aircraft's first, carrier-based testing. A team from the Navy Unmanned Combat Air System program office (PMA-268) embarked Truman to conduct tests and demonstrations. The X-47B, which boasts a wingspan of more than 62 feet (wider than that of an F/A-18 Super Hornet), will demonstrate seamless integration into carrier flight deck operations through various tests. During each demonstration, the X-47B will be controlled remotely via a hand-held control display unit (CDU). Truman will be the first modern aircraft carrier to host test operations for an unmanned aircraft. Capt. Jaime Engdahl, N-UCAS program manager, said the X-47B's delivery aboard Truman was among the most historic moments in the program's history. "This is a very important moment for the X-47B," said Engdahl. "The moment the aircraft set down on Truman's deck was the moment it officially met the fleet." Cmdr. Kevin Watkins, N-UCAS's flight test director, agreed with Engdahl's sentiment. 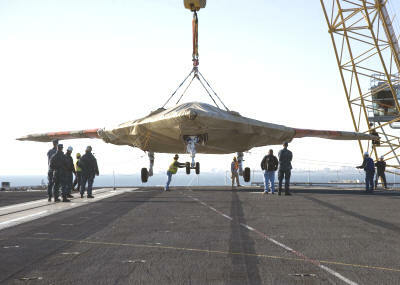 "Bringing the X-47B aboard Truman is a big milestone for the program," said Watkins. "We've been testing the aircraft for the last several years and to finally put it on a ship is so exciting. If these tests are successful, they will prove that the future for unmanned aircraft is wide open." Lt. Cmdr. Larry Tarver, Truman's aircraft handling officer, who helped coordinate the X-47B's on-load, said his Sailors are eager to participate in the aircraft's testing. "It means a lot to our crew to be part of naval history," said Tarver. "We have Sailors who received additional training to safely move the X-47B and they are excited to play a part in its testing." While technical challenges are to be expected when introducing the new system to a carrier's flight deck, Engdahl said he expects the tests to be successful citing strong teamwork between his team and Truman's crew. "The support from Truman has been phenomenal and it's going to continue to take close cooperation between the carrier's Sailors and the UCAS-D team to make these demonstrations successful," said Engdahl. "To operate large, unmanned aircraft off of a carrier, from anywhere in the world, will be a key capability for the Navy after these tests are successful." The X-47B test will be conducted over a three week period which will include in-port and underway demonstrations aboard Truman.